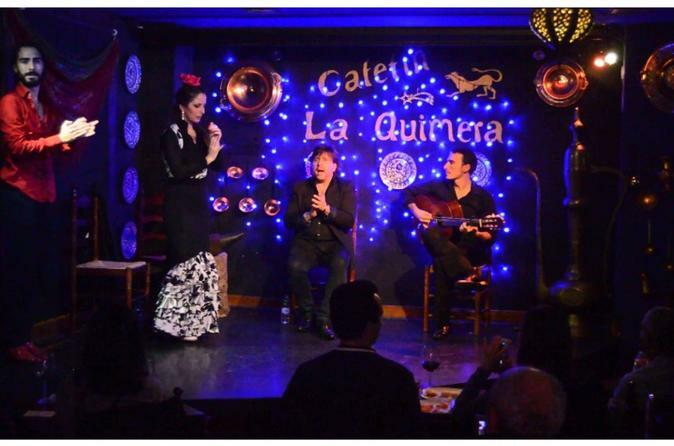 Come to enjoy on this journey to the very soul of flamenco at Cafetín La Quimera, one of the most authentic places in Madrid.This legendary flamenco tablao is not only known for the quality of its music and food, but also for the way it has avoided the commercialization and plastic image that is sold outside of Spain.There is no better place than La Quimera to enjoy the traditional Madrid dish of cocido. This tablao is known for its very particular set of rules and uncommon view in the world: there is only one truth, flamenco and cocido. You won’t find the latest technologies elsewhere and its vanguard decoration is second to none: just song, dance, guitar and applause.There is plenty of that. Even the waiters will sing a “cante jondo”, considered the most pure form of flamenco. This is an art that touches you deep in your heart and soul; there is no script or choreography, just a passionate devotion. This is an authentic flamenco experience, with improvisation, emotion and feeling, what the Andalusian call “duende”. At La Quimera you will feel the energy and the emotion of this brutal and passionate music. Be captivated by the expressions on the faces of the artists, by every movement of the body, and feel for yourself how the artists let their bodies and souls be overcome in a way provoked only by flamenco.